The acclaimed fantasy series gets even more acclaim with 13 nods for excellence in writing, acting and production. Make no bones about it, The Escapist Magazine loves HBO's Game of Thrones series. 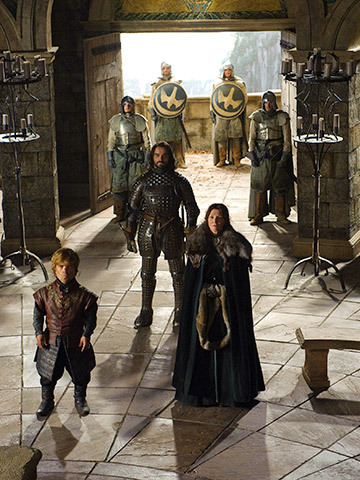 From the opening title sequence to the excellent acting and gorgeous vistas, writers and producers David Benihoff and Dan Weiss adapted George R. R. Martin's fantasy epic into a ten episode series about as well as they possibly could. The Academy of Television Arts & Sciences thought so too, rewarding Game of Thrones with 13 nominations across a broad spectrum of categories, including Best Drama Series. While Sean Bean and other standouts in the cast failed to receive recognition for their performance, I was really happy to see that Peter Dinklage was nominated for his portrayal of the Imp, Tyrion Lannister. On top of the deserved writing and directing nods, the production also received many nominations for technical excellence, such as costumes, makeup and hairstyling. I love that Emmy nominations for these categories mention a specific episode, meaning you can usually tell which scene impressed the voters. For instance, Paul Engelen and Conor O'Sullivan were nominated for Prosthetic Makeup in "A Golden Crown", which I assume was considered for the awful conclusion for one character who was not the dragon, apparently. Writing in a Drama Series: David Benioff and Dan Weiss for "Baelor"
Directing in a Drama Series: Timothy van Patten for "Winter is Coming"
Costumes for a Drama Series: Michelle Clapton and Rachael Webb-Crozier for "The Pointy End"
Hairstyling in a Single-Camera Series: Kevin Alexander and Candice Banks for "A Golden Crown"
Non-prosthetic Makeup in a Single-Camera Series: Paul Engelen and Melissa Lackersteen for "Winter is Coming"
Prosethtic Makeup in a Series: Paul Engelen and Conor O'Sullivan for "A Golden Crown"
The Emmys award ceremony will be broadcast live on September 10th, so we have a months to ponder whether Game of Thrones will beat out it's brethren on HBO like Boardwalk Empire or Mildred Pierce for Best Drama.